Members of this genus are characterized by furry rhizomes that creep along the surface of the soil, producing baskets of finely divided fronds and tangles of rhizomes. Their common names are often dedicated to various critters including squirrels, rabbits, hares, and even bears—epithets that tend to overlap in the literature and certainly in commerce. Basically they are Zone 9 to 11 plants but have a welcome ease of cultivation in households everywhere. Humidity is not critical, nor is the degree of shade/partial sun going to create a life-or-death experience. The name Davallia honors the Swiss botanist Edmond Davall (1763-1798). There are 29 or more species ranging in nature from the tropical forests of Tahiti and Africa to the Himalayas, Japan, Korea, and Australia. Common characteristics include the creeping woolly rhizomes, long stipes, and finely divided, but sturdy triangular blades. The sori have cup like indusia attached at the base as well as along the sides creating a pocket holding its contents like a cut away of a flat-bottomed ice cream cone. Away from frost zones, plants are easily grown outdoors in ordinary soil and may clamber over rocks colonizing with a tolerance for a small amount of drought and neglect. Likewise, they are certainly one of the easiest choices for basket culture, indoors or out. The rhizome is an interesting feature so give them a wiry container with ample room for the rhizomes to circle about and produce a ball of finely divided, showy greenery. If so desired reduced watering will decrease frond production with no ill effects resulting in a better display of the characteristic furry creeping "foot" (rhizome). Propagation from division is easy and immediate. Propagation from spores is effective but definitely a longer term project. Botanically we have yet another genus that is being redefined, and this is one area where the common names can be as confusing as the botanical. 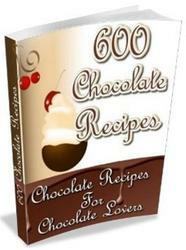 A small sampling of the commonly available species follows. A lush basket of Davallia mariesii decorates the entry area of the Coughlin home and garden. rhizomes support five-parted evergreen fronds that may live for two to three years. This species is extremely variable in dissection and habit, and multiple cultivars have been named. All thrive in good light, regular potting soil, and frost-free sites from Zones 9 to 11. Davallia mariesii (after British plant collector Charles Maries, 1850-1902) with a creeping foot named after several animals is, as distributed in the trade, a beautiful and easily established 6-in. tall (15-cm) deciduous selection. This cultivar is reputed to be the first Japanese fern grown in a pot having been thus given as a gift to a Japanese general in 1462. 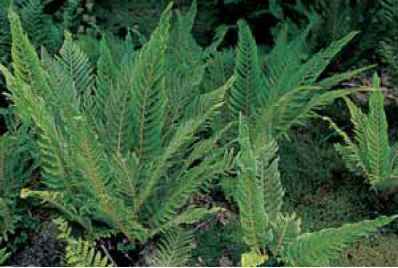 It is a resilient fern for good light and ordinary soil, outdoors in Zones 9 and 10, and indoors elsewhere. 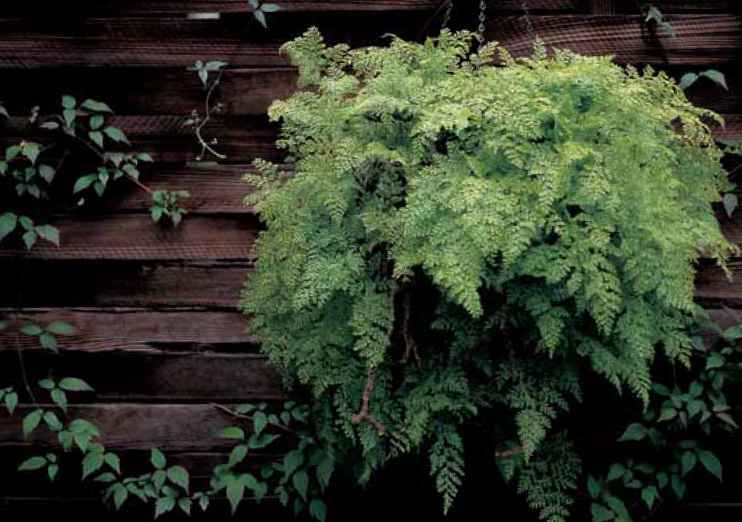 Give it a basket to effectively display the creeping fuzzy rhizome and finely divided tripinnate, triangular fronds. Pinnae sometimes overlap. In 2005 Plant Delights Nursery introduced the selection 'Korea Rocks' from the Wolchusan Mountain in Korea. It offers potential promise for cold tolerance for growers in temperate Zone 7 climates. Davallia trichomanoides (hairy) is the nom du jour of the Davallia most commonly offered in the trade. It will circle a basket with fronds that are very briefly deciduous and rhizomes that are ornamentally hirsute. Triangular fronds are tripinnate and up to 8 in. (20 cm) tall. Pinnae do not overlap. Give it bright indirect light, an occasional good soak, and enjoy. It is slightly less cold tolerant than D. fejeensis or D. mariesii. Per Hoshizaki and Moran (2001), its correct name is D. mariesii var. stenolepis. Davallia tyermannii (after Tyerman), synonym D. griffithi-ana, is probably better known by its popular former name of Humata tyermannii or by its common name white rabbit's foot. Pencil-sized silky "feet" follow the contours of a pot or basket and produce bushels of deep forest-green, tripinnate, 8- to 12-in. (20- to 30-cm) fronds. The species always presents a tidy display and is an excellent low-maintenance choice for an indoor decoration or, when protected from frost, an outdoor specimen.